Berries are elevated to a heady level in this elegant, and adult-only, dessert that is light and healthy with a touch of richness. You can prepare the red wine syrup and ricotta mixture in advance and assemble the components just before serving. Using a sharp paring knife, cut two 2- to 3-inch strips of zest from the orange. Using the fine rasps of a handheld grater or a microplane, remove 1 tsp. finely grated zest from another section of the orange. Reserve the orange for another use. In a small saucepan over medium-high heat, combine the wine, the 1/2 cup sugar and the orange zest strips and cook, stirring constantly, until the sugar dissolves, about 3 minutes. Bring to a boil, then reduce the heat to medium and simmer until the liquid is reduced by about one-third, 10 to 15 minutes. Remove from the heat and let the syrup cool. Put the berries in a bowl. Remove the zest strips from the syrup and pour over the berries. In a food processor, combine the ricotta, Grand Marnier, vanilla, grated orange zest and the 2 Tbs. sugar and process until smooth. 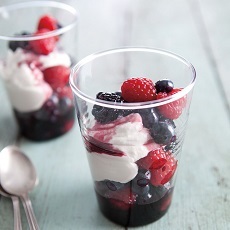 Spoon the berries with some syrup into glasses or small bowls and top with a dollop of the ricotta mixture. Serve immediately.